Be a Taster! 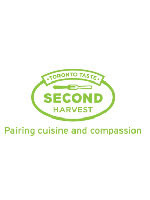 Join Second Harvest at Toronto Taste. Sunday, June 12th is Second Harvest's 21st annual Toronto Taste. The most coveted culinary event of the year will showcase delectable dishes, outstanding wines and premium beers from 60 of Toronto's top chefs and 30 beverage purveyors. Held both indoors and outdoors at the Royal Ontario Museum, Toronto Taste will be hosted by Bob Blumer, creator and host of Food Network Canada's Glutton for Punishment and Surreal Gourmet. Presented by The Daniels Corporation, the event has net more than $4 million to support Second Harvest over the past two decades, enabling the organization to provide over eight million meals to those in need in Toronto. Participating Chefs include: Food Network Canada personalities Celebrity Chef Roger Mooking (Everyday Exotic), Michael Smith (Chef at Home, Chef at Large, Chef Abroad) and Mark McEwan (Top Chef Canada, The Heat). Dishes were also prepared by acclaimed chefs such as J.P. Challet (Ici Bistro), Scott Conant (24 Hour Restaurant Battle, Scarpetta), Donna Dooher (Mildred's Temple Kitchen), Dufflet Rosenberg (Dufflet), Chris McDonald (Cava), Rob Gentile (Buca), David Lee (Nota Bene) and many more talented chefs and beverage purveyors.